Yet another video about Morgan, and her life at Loro Parque. Morgan sure looks like she is living the life, doesn’t she? Let’s read between the lines. Loro Parque trainer Claudia Volhardt also mentions that Morgan is being taught how to pee into a cup, so her hormonal cycles can be monitored. 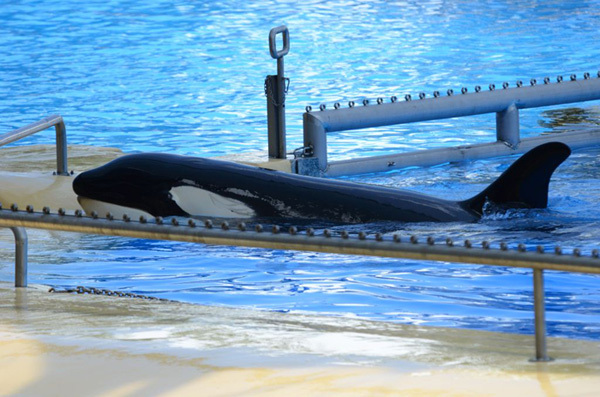 That is a key procedure when it comes to trying to breed Morgan, and Morgan offers SeaWorld (which listed Morgan as a SeaWorld asset when it filed the papers for its recent IPO) extremely valuable wild DNA for its captive breeding program. Finally, Volhardt takes the opportunity to mention the stranded orca that was shot in the head in Norway in April, contrasting its fate to that of Morgan. On the one hand, it is a fair point since Morgan was “rescued” rather than “euthanized.” On the other hand, topping a standard in which stranded orcas are shot in the head is setting the bar pretty low. And I am pretty sure that none of the release plans proposed for Morgan include a rifle. All in all, a pretty sophisticated PR effort, aimed at making the public feel okay about Morgan being at Loro Parque. Whilst I in no way defend keeping killer whales in captivity, I would like to comment that the footage of the trainer with a whistle at 0.54 is actually an old clip. The same images were seen nearly a year ago, before Morgan’s hearing issue arose. When I visited Loro Parque to observe Morgan six months ago, I was there for multiple days and observed training sessions with Morgan where visual signals were used for her. When Morgan participated in a show one afternoon, she did not respond to any whistles used by the trainers. Morgan has also made no intergration of the calls of the other orcas into her vocabulary, which is very unusual considering the length of time she has already been there. From my observations of Morgan, there seemed to be no indication that her hearing was normal.